Layered Chocolate Cheesecake with Oreo Crust – creamy, moist and very delicious cake! 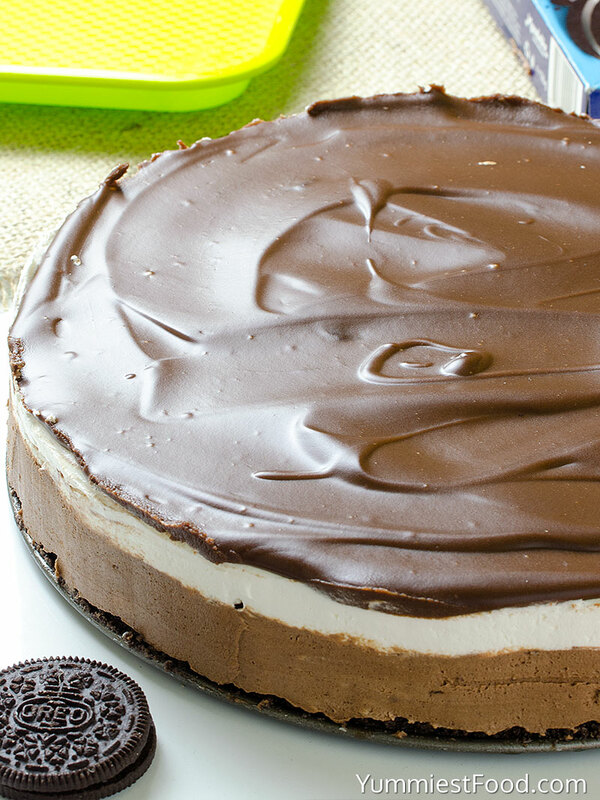 Perfect for every occasion and so easy and quick to make – Layered Chocolate Cheesecake with Oreo Crust – No Bake! 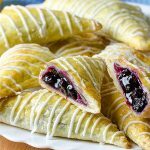 Can you imagine that you make your favorite recipe for a short time and without baking? 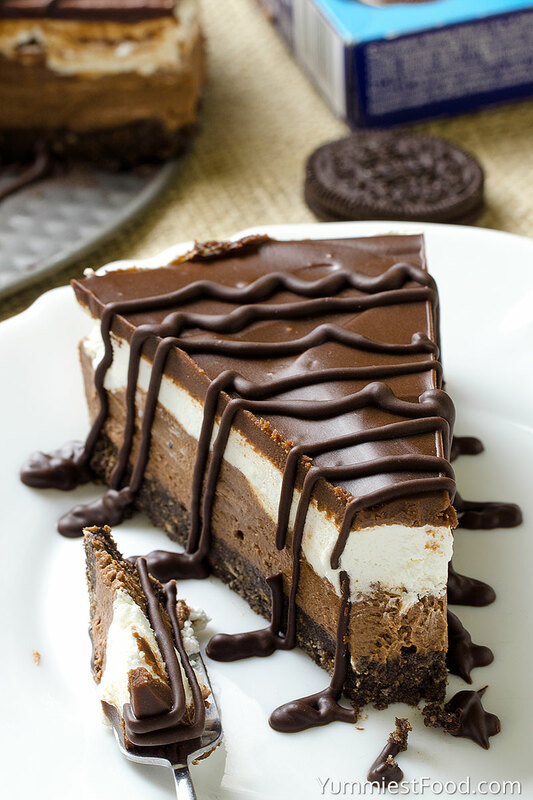 I couldn’t believe in this till I haven’t tried this Layered Chocolate Cheesecake with Oreo Crust. 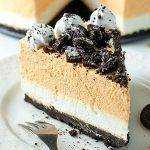 This Layered Chocolate Cheesecake with Oreo Crust is my choice for dessert today and I know that you will love it! 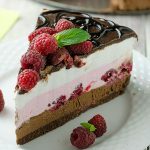 I am pretty sure that this dessert will become favorite chocolate dessert and I know that your family will love it too. This Layered Chocolate Cheesecake with Oreo Crust is the most delicious and the most beautiful cake I have ever made. There is no anything more romantic than melted chocolate I your mouth. 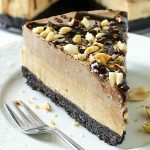 I have made this Layered Chocolate Cheesecake with Oreo Crust so many times and I can say that it is super every time, it is unique and very moist and creamy. 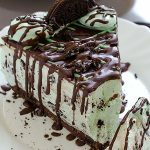 I know that you share my opinion that chocolate desserts are ideal for every occasion so I know that there are many similar chocolate recipes out there. Maybe you will think that this cake is hard to make but I know that you will be surprised when you start making it. This is one of the real and excellent combinations. This cake is sweet and it is so delicious when melt in your mouth real madness for chocolate lovers. This Layered Chocolate Cheesecake with Oreo Crust is one of the favorite cakes in my family. In certain way I have made it only for my family, but everyone else who has tasted the cake wanted the recipe. I am always happy when people want to make my recipes, but it was very funny to me when other thinks that it is hard to make this cake. Honestly, I think that I haven’t made easiest cake in last period. Today, Layered Chocolate Cheesecake with Oreo Crust is favorite cake of my friends and their families. Layered Chocolate Cheesecake with Oreo Crust - creamy, moist and very delicious cake! 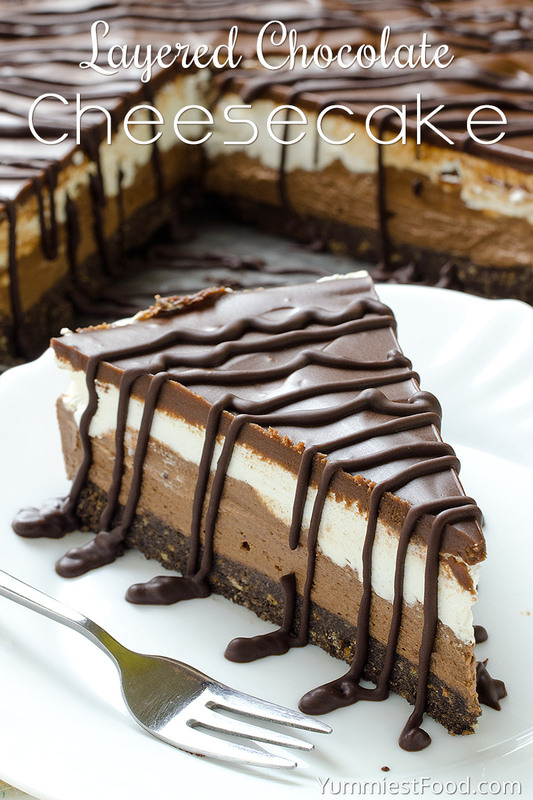 Perfect for every occasion and so easy and quick to make - Layered Chocolate Cheesecake with Oreo Crust - No Bake! Finely crush the cookies in a food processor, add melted butter and blend until it’s all moistened. In a medium saucepan stir together cream, chocolate and sugar on low heat until the chocolate is completely melted and the mixture is smooth. Cool and pour over the cheesecake. When the topping is set and cooled again run a thin knife around the sides and remove the springform pan sides. Can u substitute whipping cream for the heavy cream? Hi Aynslie, I haven’t made this recipe with whipping cream myself but you could certainly try. 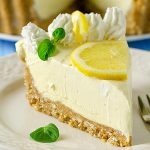 Is the whipping cream will thicken to stiff peaks? If so, yes, that will work! Too much cream cheese. I probably threw at least a cup of the mixture away. However, I have high hopes! About how many cookies do you need to make 2-1\2 cups of crumbs? Hi Dianna, You need about 26 Oreo cookies. Enjoy! Heavy whipping cream and whipping cream are the same thing. Just so long as you’re not confusing it with whipped cream. Whipped cream is like Cool whip and that won’t work. Heavy whipping cream is in the same section as milk. It’s usually next to the half and half that you buy to put in your coffee. Hope this helps! Hi. Is heavy cream the same as thickened cream in australia? Thanks. 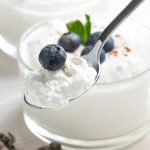 Heavy cream contains 36 % or more milkfat.Whipping cream contains only 30 %.Most of the time you can substitute one for the other.The heavy cream will hold together better so it is best to use it when you need a firmer texture.As a topping there wouldn’t be an issue. I know this is probably a silly question but do you remove the filling from the oreos? I’m 100% sure you do but I wanted to be sure. Recipe looks delicious. Hi Cali, I don’t remove the cream from the Oreo cookies for this recipe. Enjoy! I had the same question lol, and I did it with removing the cream from the Oreos. Would that possibly be the cause of my crust crumbling and not sticking to the filling when cut? Hi Ariel, I haven’t had that problem. Did you use real butter or did you use a substitute by any chance? Why can’t we use cool whip instead of heavy whipping cream? Hi Nithya, The recipe calls for whipped cream, so it’s the liquid cream that you buy and whip yourself, I haven’t made this recipe with cool whip but you could certainly try. Is the cool whip will thicken to stiff peaks? If so, yes, that will work! Great recipe! I made some slight changes to lessen the richness. Also used extra crumbs on the side all the way around! Am I reading it correctly that you need 4 (8oz packages) of cream cheese so 32 oz of cream cheese total? Hi Lauren, Yes, you need 32 oz of cream cheese. Enjoy! I made this cheesecake and it was delicious but large. I’m wondering if I can freeze the leftovers? How long will it store in the refrigerator? Hi Barb, It probably could but I have never frozen so I can’t say for sure. This cheesecake can be made a couple of days ahead of time and stored covered in the fridge. I actually love this cheesecake the day after I made it and even on the second and third day. I would just make it like 2 days in advance or the day before and leave it in the fridge. 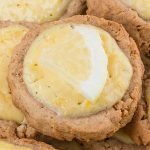 Just come across this recipe – I make lots of cheesecakes and this one looks super! I have frozen (undecorated) cheesecakes many times and they are fine. I freeze them in the tin, which I cover with cling film, then foil, then a polythene bag. I get them out and put them in the fridge the night before I need them, removing all the wrapping and replacing it with a new piece of clingfilm. When I’m ready to decorate it, I take it out of the tin, decorate it and then put it back in the fridge (uncovered) until I want to serve it up. Incidentally, I always use double cream (heavy cream in the USA) in my cheesecakes. I live in the UK. Thank you for such a nice comment, Jackie! Did you have any luck freezing the cake? Make this along with another cake for a birthday party and was considering freezing the cheesecake and then defrosting it on the day. Hello, I liked the recipe since it was quick and easy, I had made few modifications in the plain filling layer , I added some coffee extract to add in a mocha flavor. I have put the cake in refrigerator for 3 hours already, doesn’t really look firm enough to me. How long does it take actually to be firm enough? Hi Dimpy, it took me an hour but, you can refrigerate it overnight. I hope it helps! It is possible that the liquid extract you used may have made it too watery. I usually just use instant espresso powder when I want a coffee flavor. You’re very welcome Danielle! 🙂 Thank you for such a nice comment! I’m glad that you like the recipe! I’m making it for Mother’s Day in a rectangle pan. Used 1 pkg. of regular Oreos for the bottom. We haven’t had it yet, but the bowl tidbits are delicious. Thank you! I’m looking forward to it! You’re very welcome Marie! 🙂 Thank you for such a nice comment! I’m glad that you like the recipe! Doesn’t this need gelatin to set? I’m new at using a springform pan how should we line it? Hi Angeline, Line the bottom of a 9-inch springform pan with parchment paper grease the side of the springform pan or with butter or cooking spray. This is the best cheese cake I have ever tried. Thanks!!! You’re welcome! 🙂 I’m glad that you like the Cheesecake! Hi Safaa, I haven’t made this recipe with substitute myself but you could certainly try, you can make a substitute by combining whole milk and melted butter. This will not whip like regular heavy cream, but it works fine to substitute heavy cream as a recipe ingredient. For each cup of whipping cream, use 3/4 cup of whole milk and 1/3 cup of melted butter. Melt the butter and mix it with the whole milk until the cream is thick and frothy. Make sure you have let your butter cool before pouring it into milk. Enjoy! I made this for a neighborhood get together that I hosted It was fantastic. Everyone raved about it. The next week someone else hosted the get together and there were requests for me to make this again. I also sent this recipe to my brother who made it and his family loved it as well. Definitely a keeper!! Very delicious- it was a huge hit! Can this recipe be made in a rectangular pan instead of a springform pan? Hi Lisa, Yes, you can made this recipe in a rectangular pan. Thank you! I’m making this awesome recipe to take to a family dinner! You’re very welcome Lisa! 🙂 I’m very glad you like the recipe! I just made this cheesecake for the first time a few days ago and had it for Thanksgiving dessert. It is soooo delicious! Very easy to make. I like that I don’t have to bake this cheesecake. I am planning on making this again for Christmas. Thanks so much for sharing the recipe. You’re very welcome Patti! 🙂 Thank you for such a nice comment! I’m glad you like the recipe! Do you have to beat the 3/4 cups of heavy cream for the topping or just pour in the liquid? Hi Vicky, you just need to pour in the liquid. How would you recommend transporting this cheesecake? Thinking of making it for an auction event. Would it be ok to take it out of the springform and put on platter for a number of hours? Hi Jennifer, Let it sit in the fridge, then just remove the springform sides and you’re all set. I saw this recipe and new I had to have some time in the kitchen to play! I replaced 1 and 1/2 of the cream cheese blocks with Non-fat Greek Yogurt (pressed/strained for more thickness) and to counter the tartness of that, used semi-sweet chocolate instead. The result is simply amazing! Thank you! You’re very welcome, Nika! 🙂 Thanks for sharing this great comment! Do you think I could half the recipe and use a smaller pan?